Many wagashi sweets include anko. The intricate ones typically use shiroan, a white bean paste, that can easily be colored. I’ll admit; I wasn’t a fan of anko, or red bean paste, when I arrived to Japan. I just couldn’t get over the fact that it kind of looked like chocolate but definitely did not taste like it! I only began appreciating bean paste when I started chado, or Japanese Way of Tea, lessons. 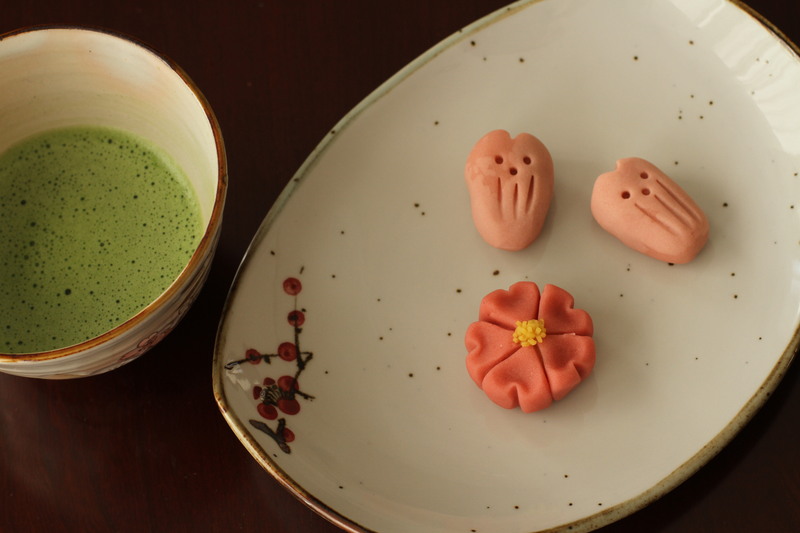 The tea procedure always includes wagashi (Japanese sweet) being served prior to the matcha (green) tea. The sweetness helps to balance the bitterness of the matcha tea. Many of the wagashi sweets that were served included anko. I was amazed at how anko could be used in very detailed pieces or a simple manju (steamed bun). Anko, sometimes called an for short, is made from azuki beans. Azuki beans originated in east Asia and continue to be cultivated here. These small beans are typically red but can be found in other colors such as black, white, gray or mixed. 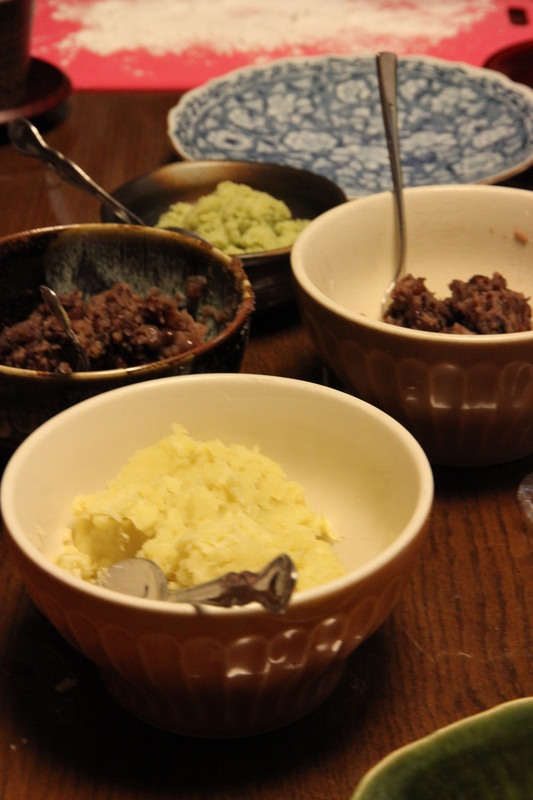 There are two main types of bean paste, tsubuan and koshian. Tsubuan is red beans that are boiled and sweetened but the shell is left intact. Koshian is red beans that are boiled and sweetened but are pressed through a sieve to remove the outer shell. In essence, this is the debate of chunky versus smooth peanut butter in America! Everyone has their own preference of which is better and why. My suggestion is to try them both and see which you prefer. The red bean paste is used in a variety of Japanese treats. One of the popular anko treats is anpan, a sweet bread filled with bean paste. This bread was even the inspiration behind the long-running children’s anime called Anpanman. The adorable character runs around allowing hungry children eat from his head (made of anpan). You can find anpan at local bakeries and convenience stores aisles all over the country. Even if you (or your child) is a picky eater, give it a try. My cousin’s daughter was visiting and is a notoriously picky eater but she loved anpan. It quickly became her go-to snack while traveling! Many anko snacks are the street food you will find at little stands in train stations or depachikas (department stores’ food floor), on most convenience stores’ bread aisles, and grocery stores. Dorayaki is two pancakes sandwiched around an anko filling. Taiyaki is fish-shaped treat with anko filling. Yokan is a steamed gelatinous sweet served with matcha tea in thin strips. Manju is steamed bread with an anko filling. In the hot summer heat, try kakigori which is shaved ice with green tea syrup and sweet beans on top. As you can see, there are a variety of ways to try anko on your next visit to Japan. If you don’t like one, try another. I’ve found that I like some and others I don’t. One quick note on the word an, it does not always mean red bean paste. Shiroan is a white bean paste that is typically used to create the colorful and intricate wagashi. Edamame an is steamed edamame that is pureed. Chestnut (kuri) an is steamed chestnuts and pureed. For those living outside Japan, I’ve included a recipe for red bean paste. Give it a go and then use the links below to create some delicious Japanese treats at home. At a wagashi cooking class in Kyoto, The many types of an. From front, satsuma imo (sweet potato) an, red bean paste, and edamame an. While slightly more time-consuming than purchasing the premade variety at the store, this recipe allows you to tweak the sweetness of the paste to your liking. If you prefer to not make the red bean paste yourself, look at Japanese or Asian markets for it. Wash beans in cold running water. Place in pot covered with water and bring to a boil. When boiling, drain water. Repeat 2-3 times until bitter flavor is gone. On third time, return to simmer for 40-60 miutes over medium heat. Bean should always be submerged so add water as needed. The beans are done when you can easily break the bean with a spoon. Drain all water. Break down the beans by spoon (or food processor). Return beans to pan and add sugar. Over low heat, warm bean and sugar mixture until good texture has formed. Add a pinch of sea salt. *If you prefer a smoother variety, push the bean paste through a sieve after lightly mashing yourself. Discard the outer shells. *You can wrap in plastic wrap and freeze until needed. While this recipe shows strawberry, feel free to use any seasonal fruits. I personally enjoy the persimmon (kaki) daifuku. Who doesn’t love two pancakes with some sweet bean paste sandwiched between them?!? As I was reading I was wondering if you’d point out how “an” can refer to so much more than an made of azuki. I think I’ve ever heard it in relation to fillings like in savory western foods or even in stuff like peanut butter cups!